If you haven't seen The Force Awakens (or haven't had some pun on social media ruin it for you) get outta here, you crazy kid, because there's spoilers about the film ahead. 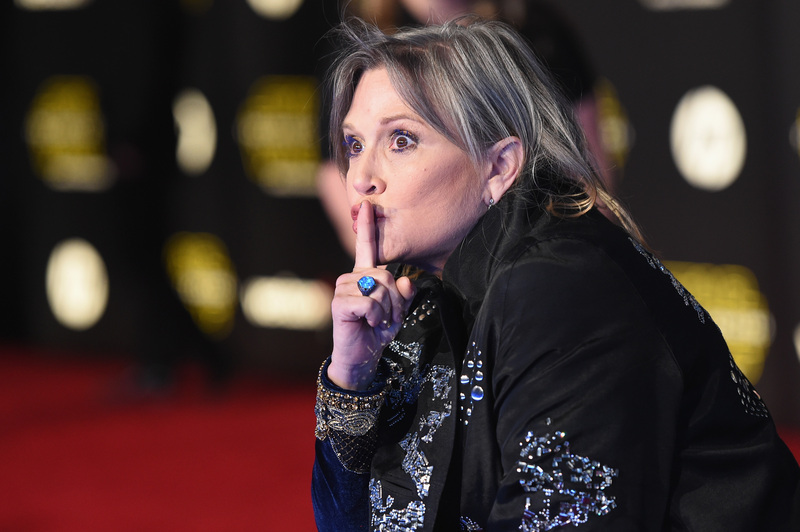 Speaking of spoilers, as reported by Huffington Post, Carrie Fisher may have accidentally dropped a spoiler for us all about Han Solo's possible funeral in Star Wars: Episode VIII at a panel discussion at Star Wars Celebration. According to Huffington Post, at the panel, host Warwick Davis asked Fisher about what happened between the final episode of the original trilogy Return of the Jedi and The Force Awakens. It seems that at this point Fisher became confused and thought Davis was talking about the time between The Force Awakens and Episode VIII, as she said "Han's funeral..." before trailing off and finishing with “the old one, oh. Han and I have a very, very volatile relationship, obviously, which leads to space divorce as you know. No, I don’t think we are divorced ― just estranged.” Her very instant transfer of topic and then instantly jokey manner makes it seem like there's more to the story than what's Fisher's giving.This point leads me to believe we might get to see Han's funeral in the opening of Episode VIII, which would be just the closure we all need. Maybe what Fisher meant is that the funeral will have happened in the in-between time of The Force Awakens and Episode VIII, which will be released December 17, 2017. But maybe, just maybe, the movie will open with a good, old-fashioned goodbye salute to one our favorite smuggler/scoundrel/hero/royal consort. Then, we'll get more than just a Leia/Rey hug and a Chewy moan here and there to deal with the pain. Who knows, maybe even Kylo Ren will hop on over to add some Dark Side pizazz to the whole affair. I wouldn't put it past him. My only wish is that we haven't seen the last of Mr. Solo. A funeral followed by a nice flashback would be ideal. They can't just take someone that important away from us without giving something back. But alas, we'll probably have to wait until 2017 to find out. May the Force be with you all in this time of confusion and hopeful anxiety.